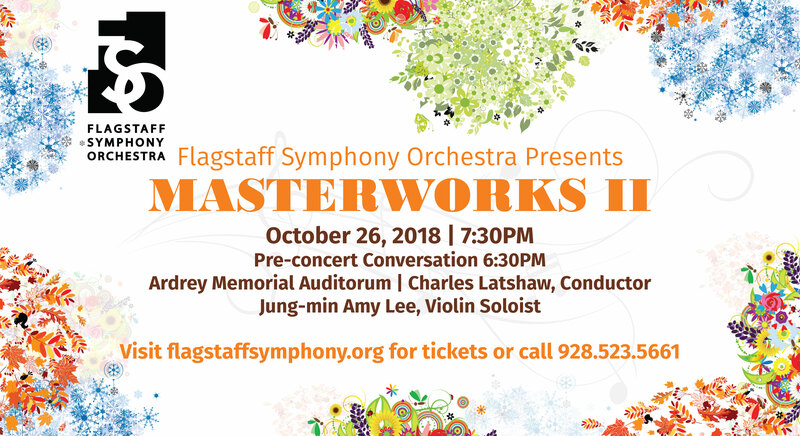 Maestro Latshaw conducts the second concert of the season at Ardrey Memorial Auditorium on the campus of Northern Arizona University, Friday, Oct. 26, at 7:30 pm. The performance will be preceded by a conversation with the conductor beginning at 6:30. 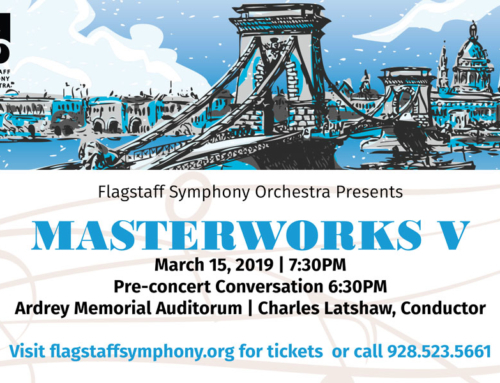 For another innovation in this concert, Latshaw has invited more than 40 local students to perform along with the orchestra during the second half of the performance. 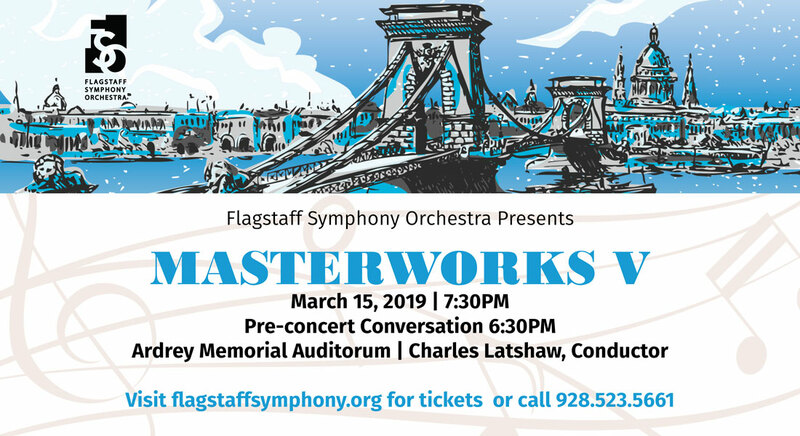 FSO cellist and Northland Prep orchestra teacher Mary Anne Bruner helped to arrange for students from Northland Preparatory Academy, BASIS, Coconino High School, San Francisco de Asis, and Flagstaff High School to participate. “One of my greatest joys is joining professional musicians with students to perform together. What an extraordinary experience for all of us – the students discover how a professional orchestra operates, and they gain a new sense of the broader musical world beyond their own classrooms. And the professional musicians get a renewed sense of how wonderful it was to play this repertoire for the first time, and what a great privilege it is to live our lives in music,” Latshaw said. The evening begins on a serene note. British composer Ralph Vaughan Williams borrowed a tune from a 16thcentury composer of the English Renaissance to create Fantasia on a Theme by Thomas Tallis. The 1910 piece suggests the bucolic rolling hills, pastures and moors of England. Like Vaughan Williams, the great Baroque composer Antonio Vivaldi was inspired by the countryside around him – in this case, Mantua, Italy, where he was employed around 1721 by Prince Philip of Hesse-Darmstadt.Vivaldi’s best-known work is The Four Seasons, evoking different times of the year in the scenic Lombardy region of northern Italy. The four violin concertos are enlivened by representations of sounds in the natural world, from specific bird songs to flowing streams and storms, and even a barking dog in the second movement of the Springconcerto. Jung-min Amy Lee is the violin soloist. Ms. Lee has been the associate concertmaster of The Cleveland Orchestra since 2008. Making her solo debut with the Philadelphia Orchestra at age fifteen, she holds a bachelor’s degree from the Curtis Institute of Music and a master’s degree from the Juilliard School. 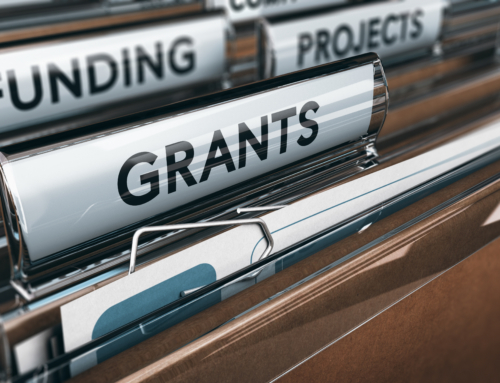 Awards include first prizes in San Francisco’s Irving M. Klein International String Competition and the Corpus Christi International Competition for piano and strings. With the addition of the side-by-side strings students, the orchestra returns after intermission to perform Tchaikovsky’s popular Serenade for Strings in C major, which highlights the expressiveness of bowed and plucked strings. 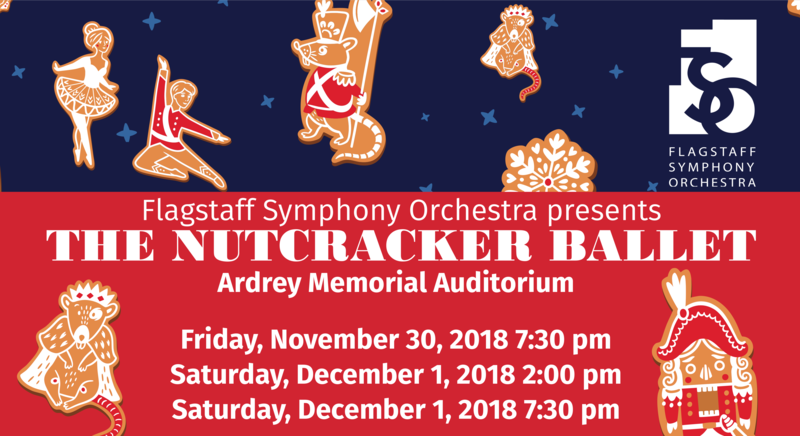 Composed in 1880, it has proved to be a perennial favorite, with portions of the score used in films, and as the foundation of a 1934 Balanchine ballet, Serenade. The first movement is an homage to serenades by his idol, Mozart. Portions of the final movement are based on Russian folk songs and dances. 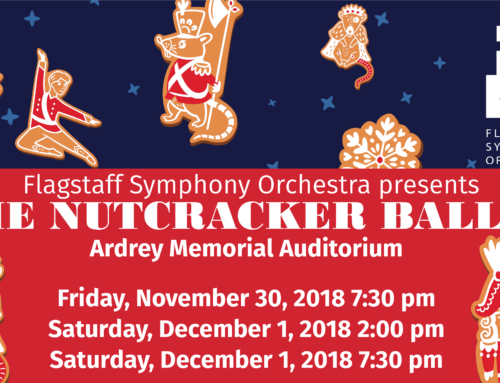 Tchaikovsky re-introduces the chorale from the first movement before bringing the serenade to its finale with a joyful reprise of the fast-paced dance. Rounding out the evening is theHolberg Suiteby Norway’s most famous composer, Edvard Grieg. He was asked by the city of Bergen, his hometown, to write a piece commemorating the 200thbirthday of Ludvig Holberg, a revered playwright also from Bergen. Grieg originally wrote the suite for piano, but adapted it for string orchestra in 1885. Subtitled “Suite in Olden Style,” it has an introduction and four baroque-style dances, referring back to the music of Holberg’s time. Be lulled by the moving fourth movement, Air, and then listen for a country fiddle-player in the lively final movement, Rigaudon. 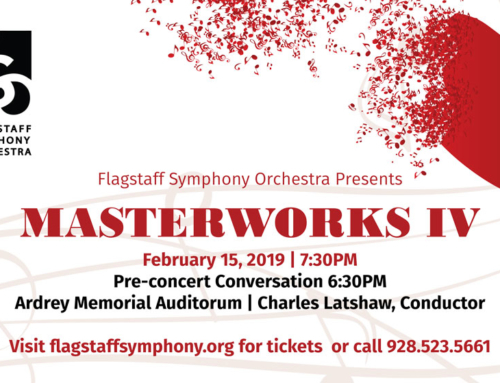 For information and tickets, contact flagstaffsymphony.org or the NAU Central Ticket Office, 523-5661. The concerts are held at Ardrey Memorial Auditorium on the campus of Northern Arizona University. 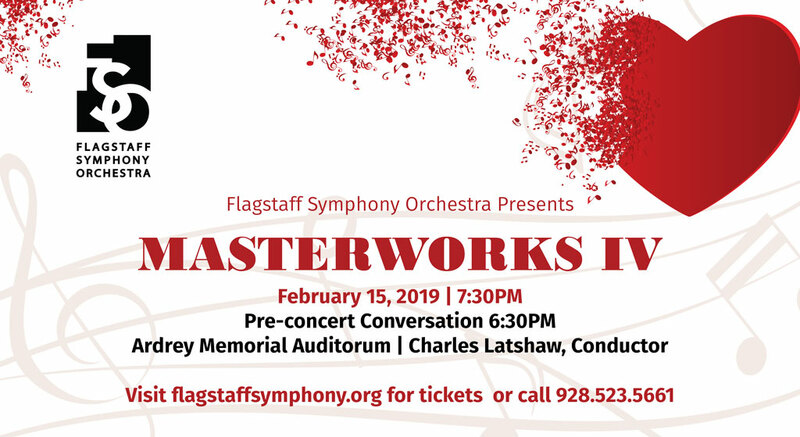 The mission of the Flagstaff Symphony Orchestra is to enrich, engage, and inspire our community through the performance of orchestral music. Founded in 1950, the FSO is a regional orchestra of more than 60 musicians that annually reaches an audience of more than 14,000. 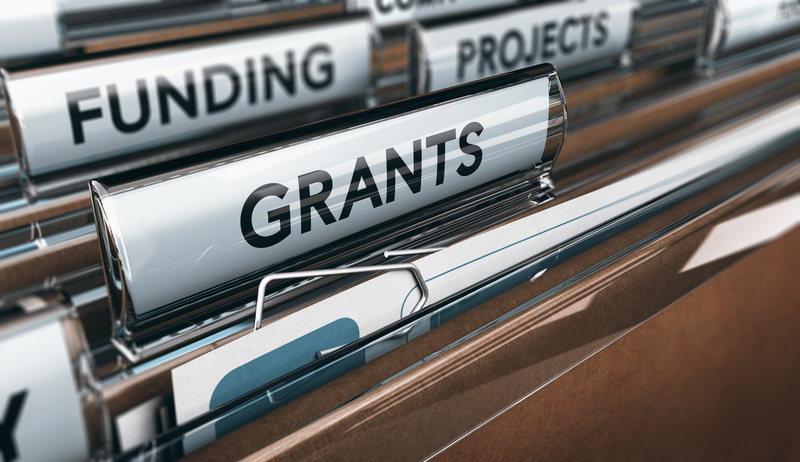 Beginning its 69th season, it is the largest and most active nonprofit performing arts organization in northern Arizona.